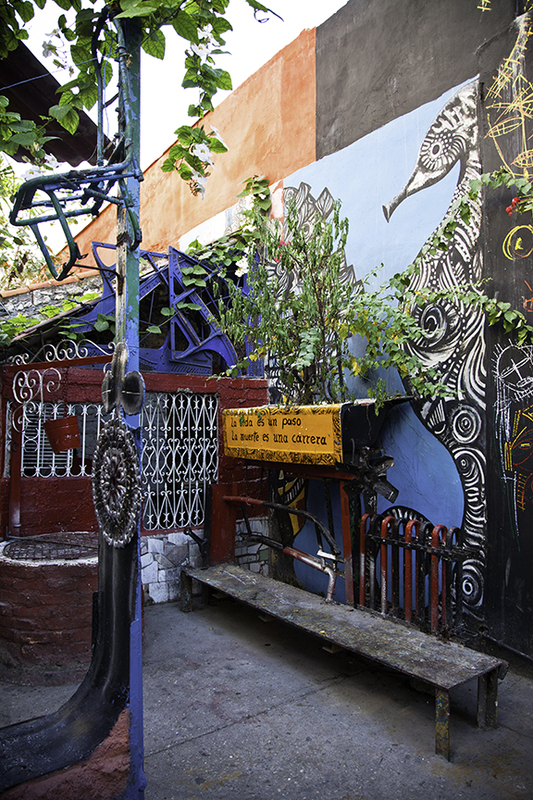 Not far from the northwestern edge of Centro Habana lies a narrow alley, its boundaries defined by Calle Espada on the west and Calle Hospital on the east. This alley, maybe 200-yards in length, is named the Callejón de Hamel. According to one source, its namesake was a French-German named Fernando Hamel, “a smuggler who ran weapons during the American Civil War” before settling in this section of Havana. 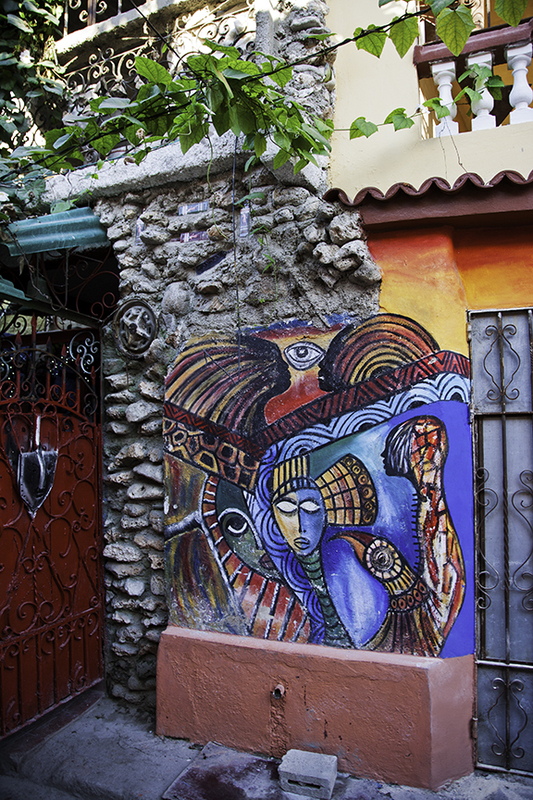 This particular section of Havana is known as Barrio Cayo Hueso. Not to be confused with Florida’s Key West, also referred to by Cubans as Cayo Hueso, “Barrio Cayo Hueso” stands for Cay of Bones. That is because this early 20th-century settlement of tenements was built on top of the Espada Cemetery, which was closed and abandoned in 1878. Bario Cayo Hueso, and the Callejón de Hamel in particular, first gained recognition in the 1940s-1950s as the center for a genre of Cuban song known as Filin. During this period, the musical founders of filin would meet in the house of the musician Tirso Diaz, located in the Callejón. 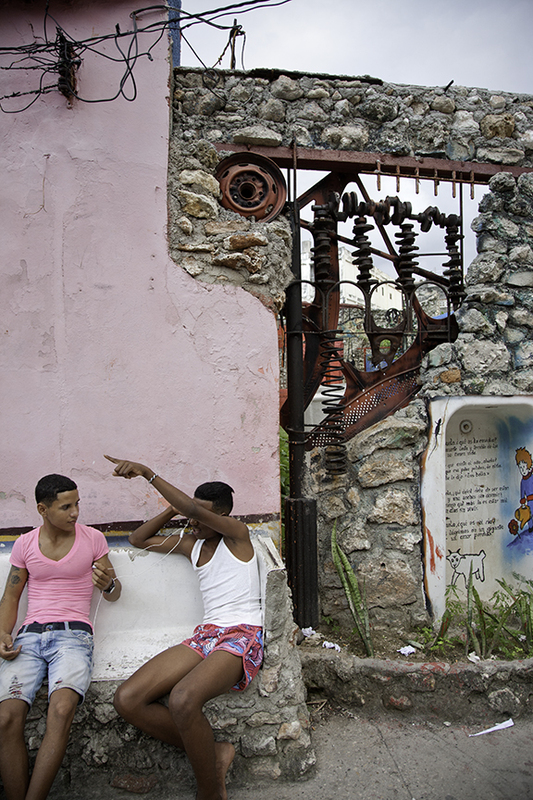 As interest in filin waned after the Cuban Revolution, the Callejón fell off Havana’s cultural map. 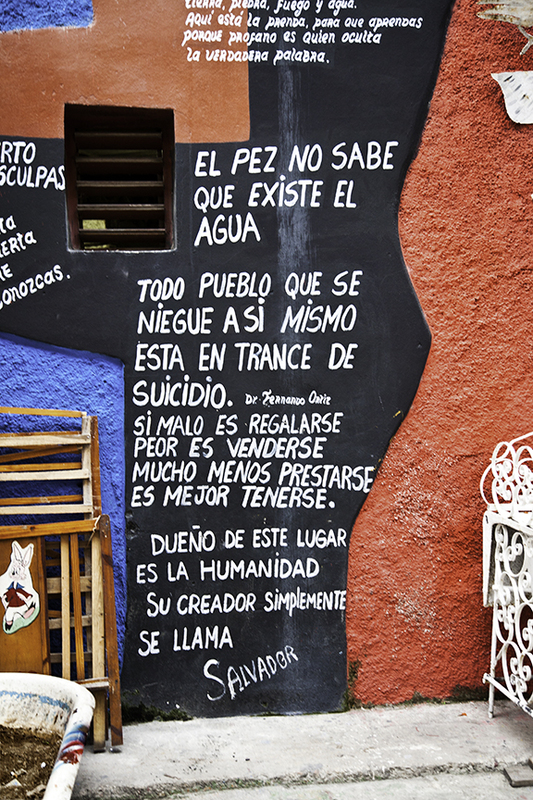 But in 1990, the artist Salvador Gonzáles Escalona arrived there to paint a mural on a friend’s house. He stayed; he still lives there; and he ended up transforming the entire length of the Callejón into a unique example of urban installation art. 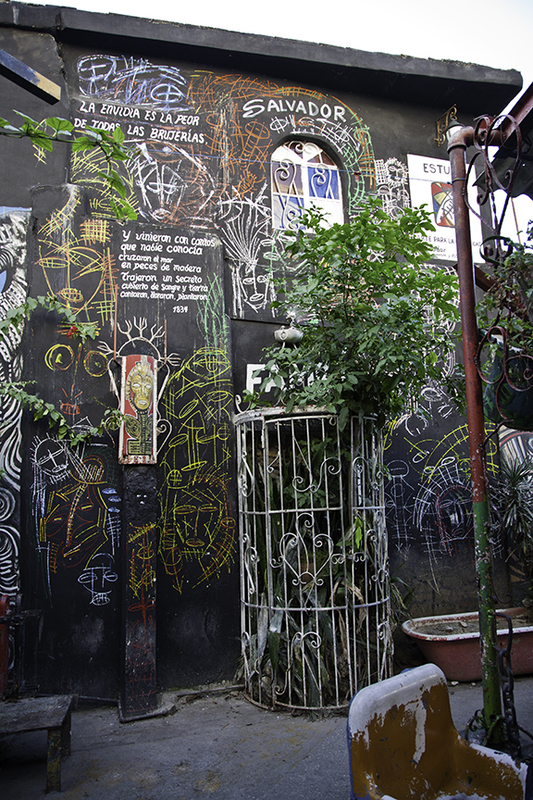 As Wikipedia notes, “the street was transformed from a slum area to an enthusiastic Afro-Cuban centre.” It could be argued that the Callejón de Hamel offers a rare example of how a decrepit urban area can be transformed into a vital artistic and social center not by the “normal” infusion of governmental, corporate, or individual wealth, but through the vision and dedication of an individual of meager economic means (supported by the encouragement of his neighbors). The following photographs document the Callejón, starting from its two access points on the east and the west, then proceeding into its center. Because I have no background in Afro-Cuban art and iconography, nor did I have the fortune to meet Salvador, I cannot identify the paintings and sculptures either by title or subject. Where the murals contain text, however, I provide translations (with the help of my friend, Peter Lamphere), and I will, occasionally, offer some general artistic observations on a particular work of art. Otherwise, Salvador’s work effectively speaks for itself. This eastern entrance, visible in three of the five above photographs, assumes the form of a three-arched gateway or propylaea. 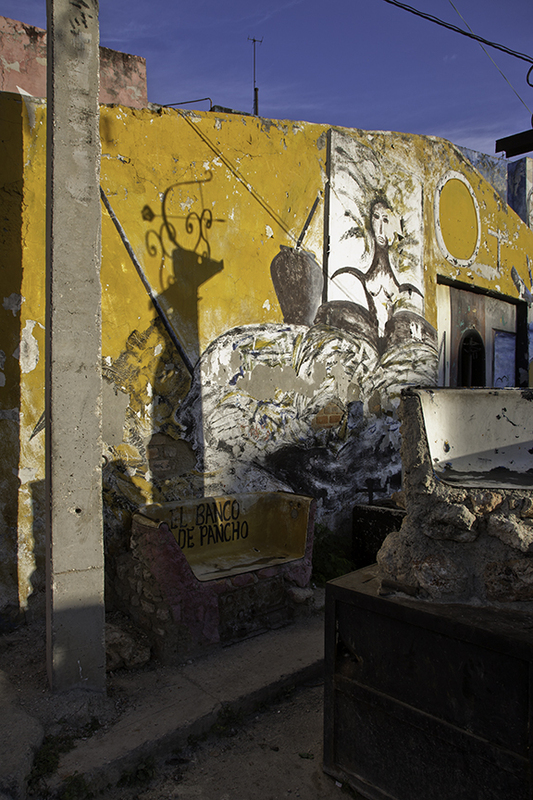 It is made of crude, uncoursed masonry (which may well be stone rescued from collapsed buildings of the neighborhood).The third and fourth photographs above show one of Salvador’s ubiquitous pieces of functional sculpture: discarded steel bathtubs cut down to make benches for the inhabitants and visitors. El cobarde le huye a la verdad porque la mentira es como el. The coward runs away from the truth because the lie is like him. Cuando quieta la pisada del andar constante fuertemente apretarás tu vida y en lágrimas manchadas tus ojos quedarán secos por el crepitar de tus soles incomprendidos. Será tu canto piedras callecidas, Que polvo y tierra tragaran desnudas para florecer un dia, nadie sabe como, ea un manantial de luciernagas blancas y alli en el replejo de agua, estará tu rostro quemado de tiempo, plagado de furia sin contestar diras ‘Vida’ para ser devuelto a la tierra. When the footsteps of constant walking are still, your life will strongly tighten and in stained tears your eyes will stay dry by the crackle of your suns. It will be your song of calloused stones, that dust and earth will nakedly swallow to bloom one day, no one knows how, into a fountain of white fireflies and there, in the water’s reflection, will be your face burned by time, plagued by fury with no answer, you will say ‘alive’ to be returned to the earth. No formal, architectural statement marks the entrance from the west. 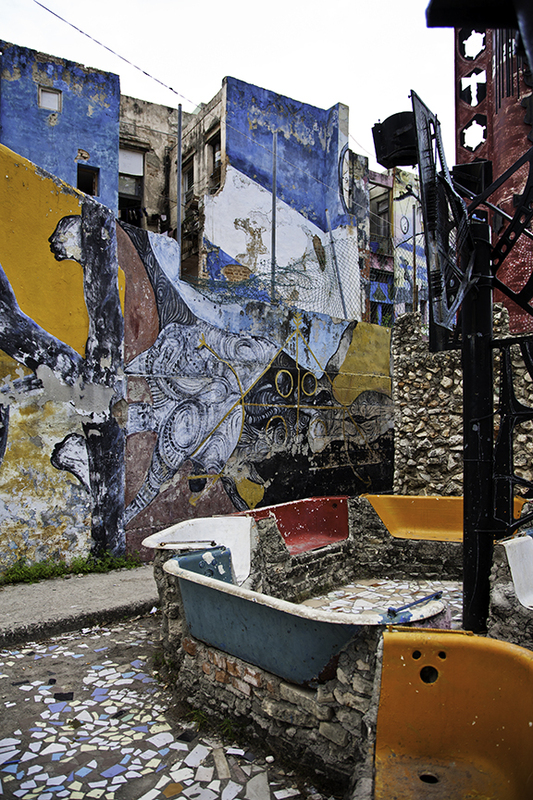 But starting at the intersection with Calle Espada, this bold mural of over forty feet introduces the Callejón and makes it clear that we are entering a special place. Venture a bit further east (beyond the door pictured directly above) and there is no denying that one has entered a space completely different from any other street (or place) in Havana. You are now in Salvador’s world–a world inspired by the various cultures of Africa which came over with the slave trade, Catholicism inherited from the Spanish, and modernism inspired by some of the major artistic movements of the 20th-century. The three photographs directly above show the range of Salvador’s material and media. 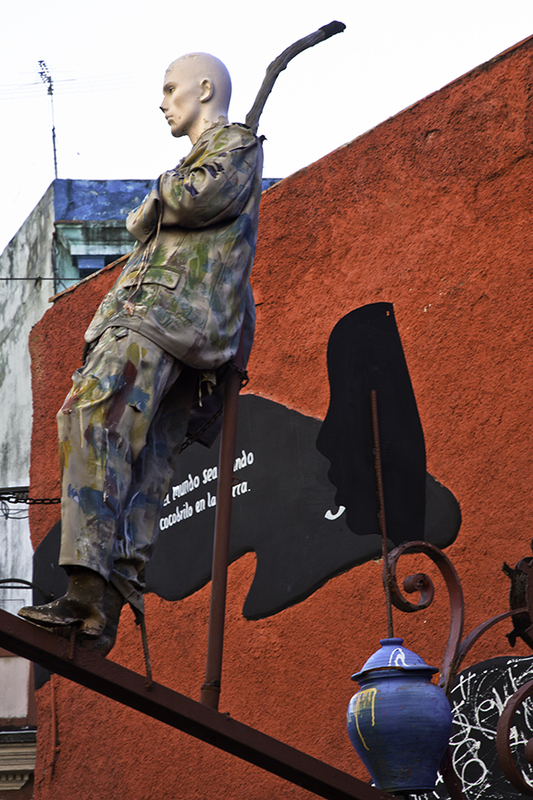 I would argue that Salvador considered the Callejón de Hamel as a total work of art, one which would unite all the various arts into an expansive cultural synthesis.We already have seen how he combined sculpture, painted murals, and floor mosaics to create spaces in which the viewer or participant would enter. The two photographs above reveal another aspect of this idea of an overarching artistic unity, in that they focus not on the low walls which border and define the alley, but on the walls of the buildings to the north and beyond the alley. 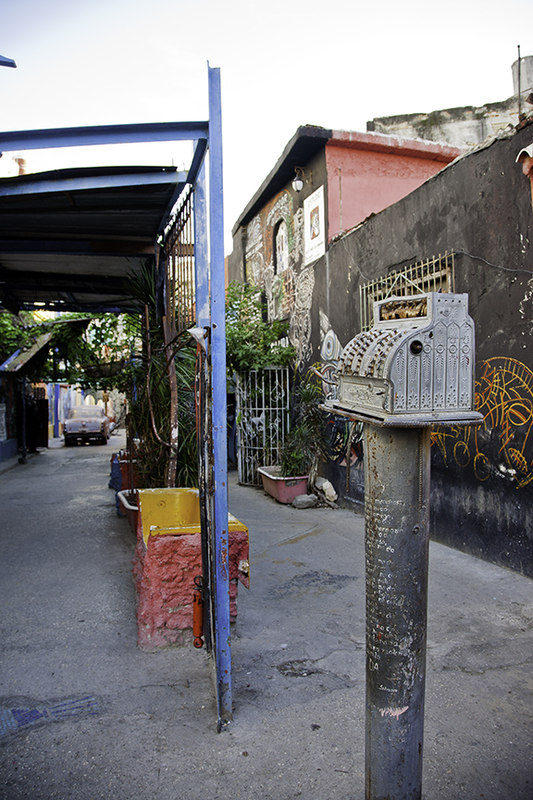 Salvador expanded his work beyond the alley to transform the more distant buildings into a participatory background. 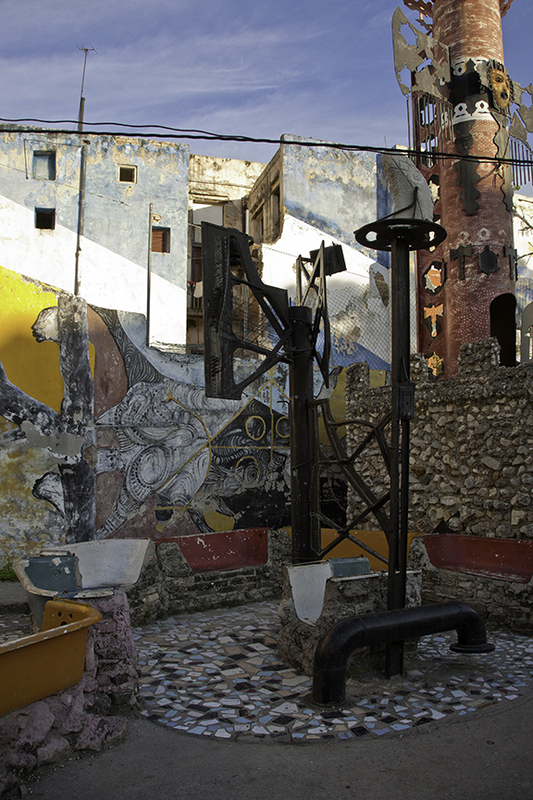 A third aspect of the idea of the Callejón as a total work of art is the fact that is has become a major performance space, not only for the local community but for Havana itself. I will elaborate on this a bit further down. Bathtubs, left whole, become wall niches for sculptures and more writings. They are like minor shrines. 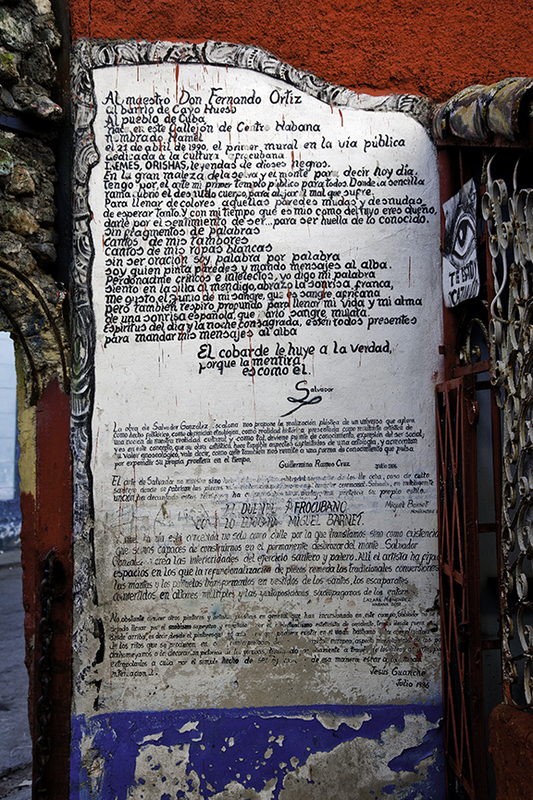 Picking up on what Salvador, himself, has stated, one source has called the Callejón “a public temple to Santería and African influences in Cuban culture.”I will elaborate on this as well a bit further down. This is a wonderful piece of sculpture. I would love to know its title, if Salvador gave it one (and I suspect that he did). Most likely it is an Orisha, a Yoruba word originally that refers to a form of spirit connected to a supreme diety. Also, ori, the root of the word, refers to the head, which is what we see here in a profile silhouette. Besides the piece’s likely reference to African culture, its profile silhouette was a device often used in the synthetic cubist works of Picasso and Braque. Which is your front side, distant enigma? Which is your back, that smiles, inert? 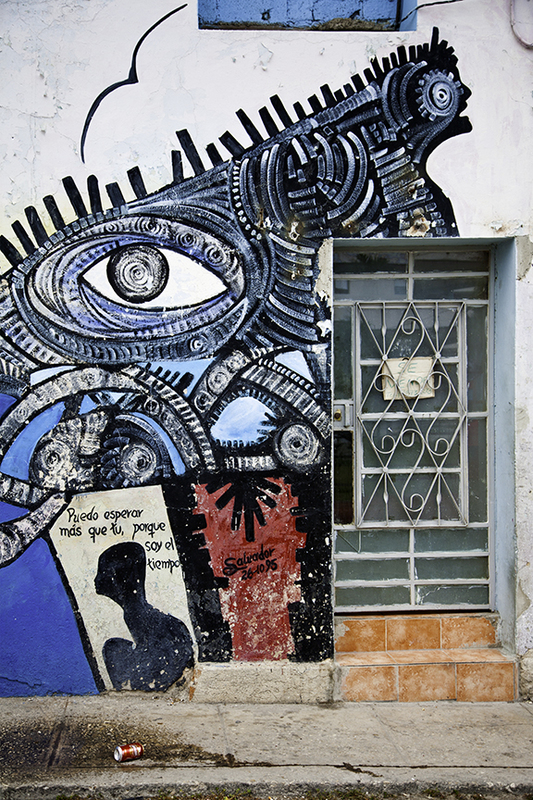 The street-level murals seen in these three photographs most likely embody some syncretic amalgam of Afro-Cuban deities. Without titles or more explanatory information from Salvador, it may be simplest to claim they (and the bulk of the Callejón’s art) is an artistic expression of Santería, in which Yoruba mythology (from Nigeria) mixes with Christianity and certain indigenous American traditions and beliefs.Apparently, Salvador even went through the Changó initiation and so is a Santería priest. 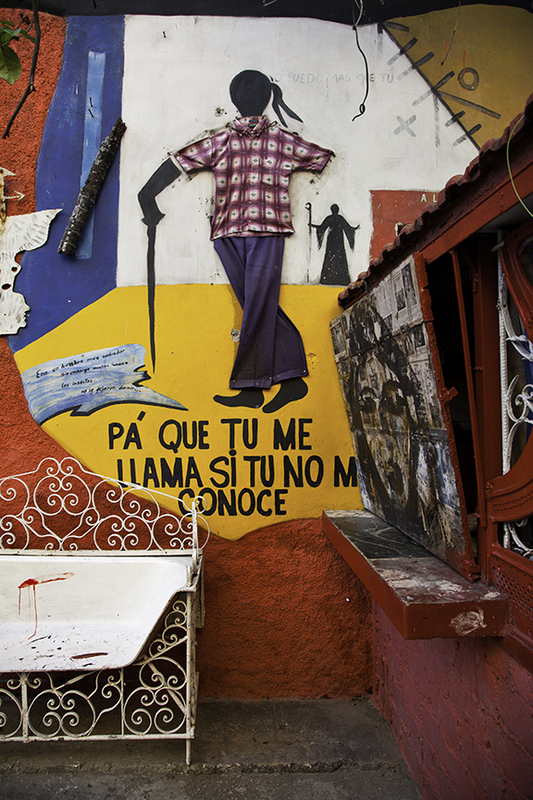 He calls the Callejón a “bastion of Afro-Cuban culture,” the goal of which is didactic–to teach and preserve the legacy of black Africa on Cuba.Quite different in nature is the long, horizontal mural above, just underneath the balcony. It depicts a rough sea on which floats what appears to be a statue of an enthroned Madonna holding the Christ Child. On the right we see the only other object other than sea, horizon, statue of the Virgin–a Cuban flag. This must be a painting of the Patron Saint of Cuba, the Virgen de la Caridad del Cobre. She, too, is a syncretic figure, associated with the Yoruba and Ifá orisha, Ochún. As with other early Marian images, she was likely brought to Cuba by a Spanish sea captain (ca. 1612) to serve as a guide and protector. 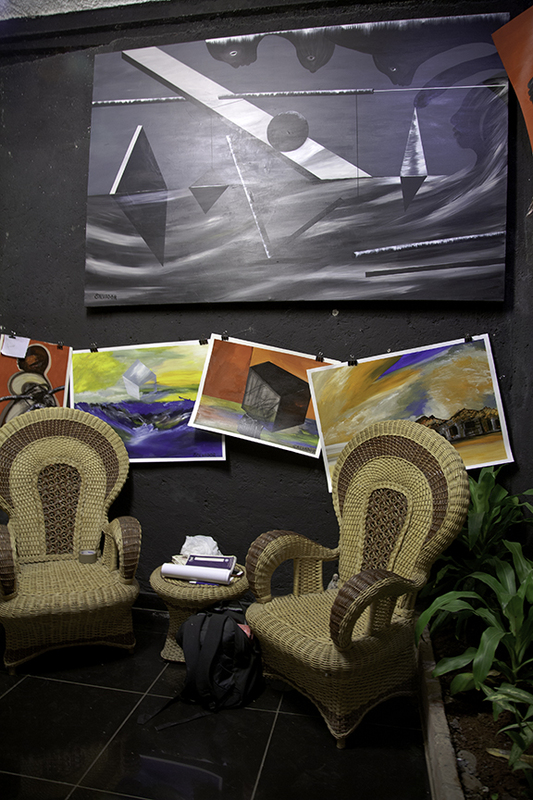 Elias Aseff Alfonso identifies the mural on the right with the red background as inspired by Ochún. So here we have a very different representation of that same, syncretic goddess: now, the Santería version of Cuba’s patroness. In this much more dramatic mural, she reveals her aspects as goddess of love, water, sexual fertility and sensuality. As the above writing informs us, every Sunday starting at noon, people gather and several rumba bands play. The bands set up directly in front of this mural, and so Ochún holds court over the performance stage.Thus, in this spot is where we can best comprehend that third aspect of the idea of the Callejón as a total work of art. 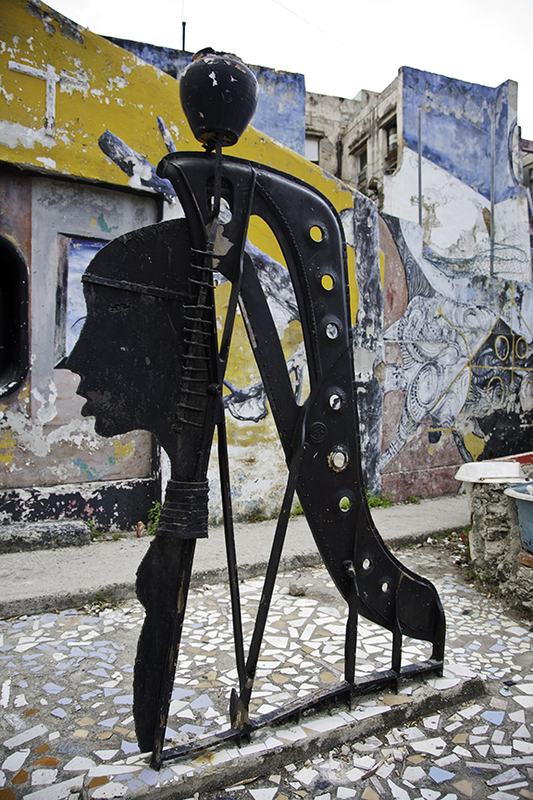 Music has returned to the Callejón; it complements the visual art; and, as Rumba, it now reaches back to its early, African roots.Besides Rumba, the Callejón lures in other Cuban musicians on Fridays and it also has become a center where Cuban children attend painting workshops. So the Callejón has played a role in reviving the Afrocubanismo movement of the 1920s-1930s, a broad cultural movement that sought to instill pride in the Africa and black culture of Cuba. 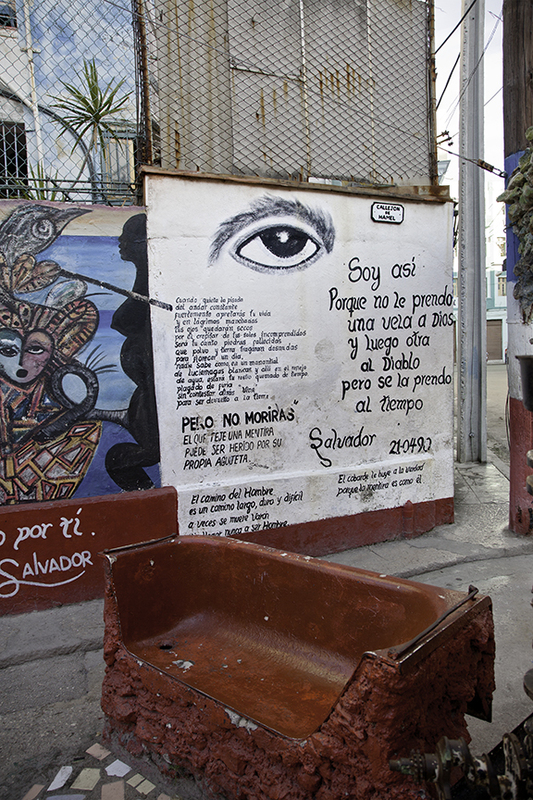 Al maestro Don Fernando Ortiz; al barrio de Cayo Hueso; al Pueblo de Cuba; nace en este gallejón de Centro Habana nombrado Hamel el 21 de abril de 1990, el primer mural en la vía pública dédicada a la cultura aprocubana. Iremes, Orishas, leyendas de dioses negros. En la gran maleza de la selva y el monte para decir hoy dia. Tengo por el arte mi primer templo público para todos. Donde la sencillarama cubrió el desnudo cuerpo, para alejar el mal que sufre. Para llenar de colores aquellas paredes mudas y desnudas de esperar tanto. Y con mi tiempo que es mio como del tuyo eres dueño, darle por el sentimiento de ser…para ser huella de lo conocido. Sin pragmentos de palabras Cantos de mis tambores Cantos de mis ropas blancas sin ser oración soy palabra por palabra soy quien pinta paredes y mando mensajes al alba. Perdonadme críticos e intelectos, yo digo mi palabra siento en la silla al mendigo, abrazo la sonrisa franca, me gusto el, zumo de mi sangre, que es sangre africana pero tambien respiro profundo para llenar mi vida y mi alma de un sonrisa espannola, que _arió sangre mulata. Espiritus del dia y la noche consagrada, estén todos presentes para mandar mis mensajes al alba. To the teacher Don Fernando Ortiz; To the neighborhood of Key West; To the People of Cuba. 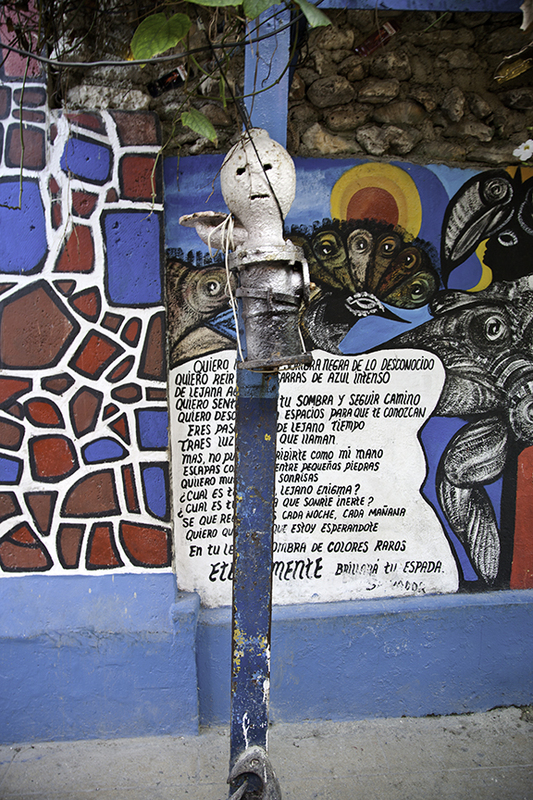 Born in this alley of Centro Habana named Hamel the 21 of April of 1990, is this first mural of the public street dedicated to the Afro-Cuban culture. Iremes, Orishas, ​​legends of black gods. In the great undergrowth of the jungle and the mountain to say now. This art is my first public temple, for all people. Where the simple branch covered the naked body, to ward off the evil it suffered. To fill with color those silent and naked walls. And with my time that is mine, like you are the owner of yours, I offer the feeling of being… to be marked as known. Without fragments of words. Songs of my drums. Songs of my white clothes without being prayer. I am word for word. I am he who paints walls and sends messages at dawn. Forgive me critics and intellects, I say my word. I sit in my chair as a beggar, embracing the honest smile, I like the juice of my blood, which is African blood, but I also breathe deep to fill my life and my soul with a Spanish smile, which made my blood mulatto. Spirits of the day and the consecrated night, be present to send my messages at dawn. The coward runs away from the truth, for the lie is like him. Salvador. In this writing, Salvador dedicates his work to Fernando Ortiz Fernández, a Cuban anthropologist, ethnomusicologist and scholar of Afro-Cuban culture who died in 1969. La envidia es la peor de todas las brujerías. Jealousy is the worst of all witchcraft. The date referred to in the second writing, 1834, is the year that most scholars cite for the emergence of Abakuá in Cuba. This was a secret, religious-based mutual aid society restricted to men. It derived from the leopard societies of southeastern Nigeria and it contributed to the music of rumba. La religión es tan antigua como el arte y el arte tan antiguo como el Hombre. Religion is as old as art and art is as old as Man. El pez no sabe que existe el agua. People who reject themselves are on the verge of suicide. Si Malo es regalarse, peor es venderse, mucho menos prestarse, es mejor tenerse. If giving yourself away is bad, selling is worse, and lending yourself is much worse. It is better to have yourself. En la puerta de manto escribi tu nombre, tan lejano como la Historia lejana, tierra, piedra, fuego y agua. Aquí está la prenda, para que aprendas porque profano es quien oculta la verdadera palabra. On the mantle’s door I wrote your name, as far back as the distant History, earth, stone, fire and water. Here is the pledge, so you learn profane is he who hides the true word. Despues de muerto no quiero ni disculpas ni regalos. After death I do not want any apologies or gifts. Vengo de una realidad oculta a una realidad abierta para que me conozcas. I come from a hidden reality to an open reality so that you know me. Dear "Unknown:'" Thank you so much for your nice comment. I base all my posts on my photos, although the topics range from art/architecture/people/places/events. There will be a few more on Havana (which I visited for a week last December-January). Thank you. I’m glad you enjoy my posts. By the way, more will soon come, now that we have had our elections. My political commentary on Facebook and Twitter consumed all my time on the computer for several months, but now I can think about working up more photographs for blog posts. In regard to the Amoeba Music mural: NO, I still do not know the artist. However, the next time I visit my LA daughter, I’ll see if I can get more information–thanks for reminding me about this. I have these exact same pictures. I was able to tour this sight. As an African American, I was blown away to see the African Diaspora in Cuba and see its similarities and differences from US. This was an experience like no other. Indeed, Trisha. The Callejon is a magical space.